Thanksgiving without the turkey doesn’t mean you’ll feel deprived. Instead of focusing on the meat, you’ll be consuming more fruits, hearty vegetables, lean protein, and delicious sauces without animal fat. Enjoying a vegetarian Thanksgiving Holiday meal boosts your fiber intake. Serving creative vegetable dishes like Maple Roasted Brussel Sprouts, and Portobello Mushrooms with Savory Lentil-Cashew Stuffing, Streusel Topped Pumpkin Pie, Sourdough Stuffed Winter Squash, Avocado and Grapefruit Salad, Chestnut and Apple Casserole, is just as mouth-watering, if not more so, than an animal-based holiday meal. In 2011 the Centers For Disease Control reported that only 26 percent of Americans ate vegetables three or more times per day. Vegetables and fruit add fiber to your diet. Colorectal cancer is the second leading cause of cancer related deaths of men and women combined. Stories about Maryland families who are raising their children without animal products, including dairy and eggs. Mouth-watering cooking ideas for non-meat Thanksgiving from the New York Times. Find even more start-to-finish vegetarian Thanksgiving recipes at About.com. 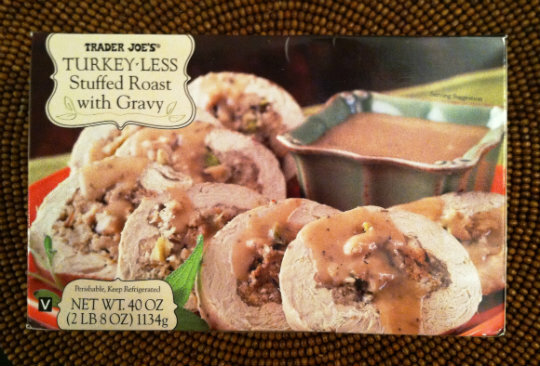 Posted on November 14, 2012, in Food, Recipes, Recommended Products and tagged Thanksgiving dinner, Thanksgiving without turkey, Trader Joe's, vegan kids, vegan Thanksgiving, vegetarian recipes. Bookmark the permalink. Leave a comment.